I found these cards at a place in Asheville. 25 cents each! It’s been a while since I’ve seen a postcard in any decent shape for 25 cents. The Queen Mary sailed the briny deeps of the Atlantic from 1936 to 1967, crossing the ocean 1,000 times. It’s now decommissioned and firmly attached to a beach in San Diego. This is a standard size card. The message on the back is great. Posted in Ephemera, Uncle Bob's Pix and tagged postcard, Queen Mary. Bookmark the permalink. Blimp? What blimp? Notice that not one person on that beach is looking upward at this gigantic blimp floating along. Well, why not, for gosh sakes? Because the blimp’s not really there. This is a composite image, as far as I can tell. Well done, too. An L-Class Goodyear blimp. The resolution of the image, plus a pesky palm frond, keep me from reading the NC number on the bottom tail fin. And I don’t know what that blue and yellow signal flag means. Posted in Existing photo processed by Bob Lawrence and tagged "Watch Doge" of the Navy, beach, goodyear blimp, Goodyear ZPG-2W, L-Class blimp, postcard. Bookmark the permalink. Posted in Uncle Bob's Pix and tagged aerial picture, Appalachian State University, Boone NC, postcard. Bookmark the permalink. This is a borderless chrome postcard, postally unused. 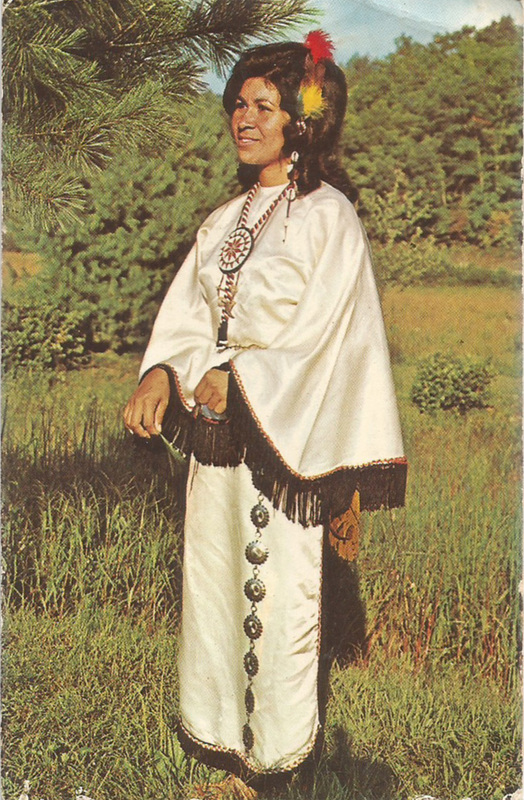 Princess Ernestine of Cherokee, North Carolina, poses in a modern adaptation of an ancient Cherokee Costume. copyright date is 1969 Aerial Photography, Inc., Charlotte, N.C. This picture had to have been taken over 42 years ago. There’s a later card I’ve seen with this exact image, but it was dated to 1988. I did a search on the web for Princess Ernestine and found that her last name is/was Grant. And that’s about all. Posted in Existing photo processed by Bob Lawrence and tagged Aerial Photography Services, Charlotte NC, Cherokee NC, chrome, Dexter Press New York, postcard, Princess Ernestine Grant. Bookmark the permalink.